chals: Things I've done this week. - I have improved the installation of Squeeze in the eeepc. I have plugged in a usb pendrive and have made two partitions there. One mounted as /home and another one as swap. This way I have more space left for the root filesystem. This afternoon I'll configure evolution and I think that will be all for the moment. Yesterday I installed Radiotray which is an awesome program to listen to the radio with just one click. I listen to Radio Paradise and Absolute Radio Classic Rock. - I have also installed a SATA controller in the main server with a hard disk of 500 GB. It adds extra "needless" storage but it is ok. The only problem is that the bios is not capable of booting from that drive. Too bad. I may find a way to do it someday. 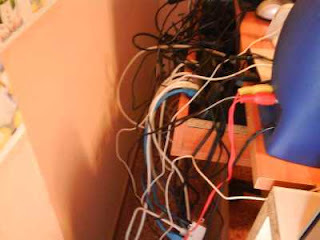 - I have also been fighting hard trying to organize the mess of cables behind the computer's desk but there was just no way. I've done my best though. - Install Squeeze on my desktop machines. - Buy present for my nephew's birthday. - Configure evolution on eeepc.